How do you tell the story of the most sustainable Olympic games in history? As approved sustainability writers for London 2012, Lark has worked with the London Organising Committee of the Olympic Games and Paralympic Games (LOCOG) on several projects. The first was to copy-edit London 2012’s 103-page Sustainability Plan, ‘Towards a One Planet 2012’, and write a new introduction for stakeholders. We then edited LOCOG’s 2009 Carbon Footprint report – on the first ever attempt to carbon footprint a summer Games – and wrote an executive summary for policymakers and press. Since then, we have created a single narrative telling the sustainability story behind London 2012. This was used by the communications/marketing teams and LOCOG executives in the run-up to the London 2012 Olympic and Paralympic Games. 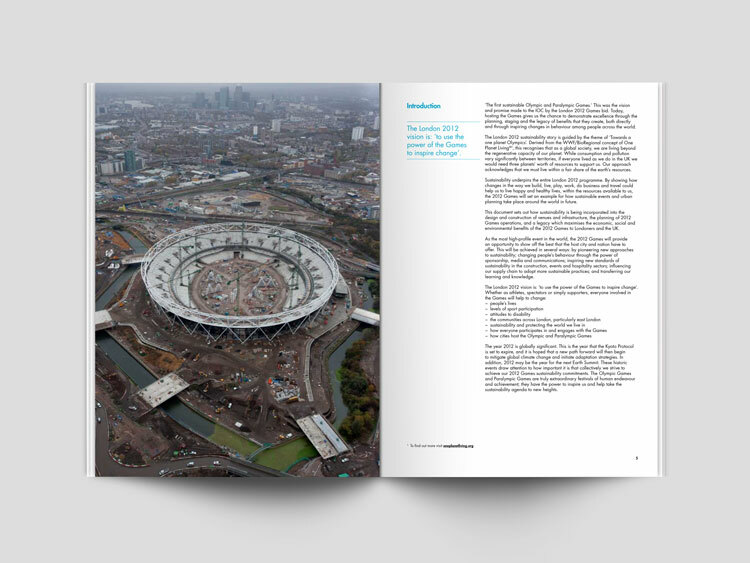 Sustainability plan: After receiving more than 90 text pages (35,000 words) from five separate teams within London 2012, we compiled, edited and condensed the copy into one coherent voice for the Sustainability Plan. This involved creating the right editorial structure, removing jargon, reducing the word count, copy-editing the text and adhering to existing style guidelines. Finally we prepared the document for design, pulling out key facts and statistics. The London 2012 Sustainability Plan was published in December 2009. We then wrote a succinct executive summary, which was accepted without any major revisions. Carbon Footprint report: We copy-edited a complex, technical document (75 text pages, 20,000 words), which outlined the methodology and results of the first ever carbon footprinting of a summer Games. As this document needed to speak to multiple audiences, we also wrote an accessible summary text to outline the process in plain English. The London 2012 teams did not need to make any major changes to our work and the report was published in April 2010. Sustainability narrative: London 2012 won the Olympic bid on the basis of staging a green Games, and sustainability is both at the heart of the build and the staging of the event. In 2010, Lark was asked to bring the key sustainable achievements together into one story. To do this we carried out extensive online research and analysed more than 20 reports about the various elements of the Games written since the bid. We then carried out face-to-face interviews with operational and communications managers at LOGOC and the Olympic Delivery Authority (ODA). After the research phase, we decided on the key sustainability goals and achievements, and created a series of interlinking, chronological stories. The resulting document has been designed to read as one overarching sustainability narrative, or as individual stories, which can be extracted and stand alone. The London 2012 team weaved our language and stories into all their sustainability communications both before and after the Games.